School picture day is on Thursday, October 11. Dress your best, and be ready to smile! Join us for our free bingo event on Thursday, October 11 at 6:00 p.m. at Catholic Memorial Home. Bring your friends to socialize, and enjoy this classic, fast-paced game that's fun for all ages. We will provide refreshments. Please see our bingo flyer for more information. Basketball signups, lunch forms, math initiative, harvest festival, and the adult faith formation program are just a few things coming up soon at Holy Name School. For recent news, please take a moment to read our upcoming events letter from our principal. We are excited to share with you our initiative to transform mathematics education. In conjunction with the other Catholic schools in Fall River and New Bedford, we have the opportunity to reshape our vision of mathematics instruction to match the demands of the 21st century. We are working with Looney Math Consulting to help us make this vision a reality. For complete details, please see our mathematics initiative letter. Holy Name’s Annual Harvest Festival is fast approaching, and we need your help! The success of this year’s event relies heavily on the volunteer efforts of parents and parishioners alike. We are asking for volunteers on Friday, October 12 from 1:00 p.m. until 5:00 p.m., and on Saturday, October 13 from 9:00 a.m. until 6:00 p.m. Please consider helping in one or more areas. Please fill out our volunteer signup sheet and return to the office. For more information, please contact Shannon Constantino, volunteer coordinator, at (508) 221-4841. 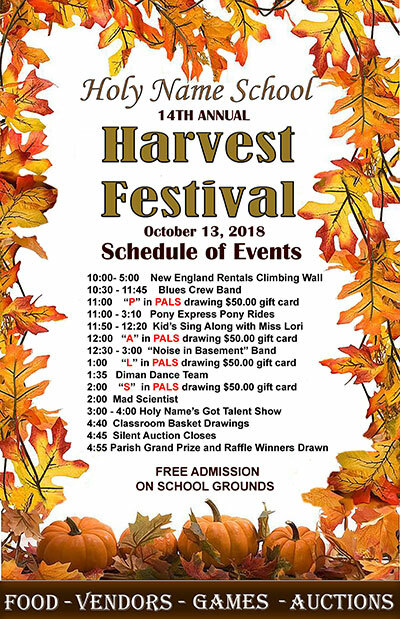 Holy Name School is proud to announce our schedule of events for our harvest festival! Don’t miss on all the fun! Come out and see us on October 13, 2018, from 10:00 a.m. until 5:00 p.m. We will have games, auctions, and loads of fun! We hope to see everyone there! Please consider baking some of your favorite tasty treats to sell at our harvest festival bake sale! It is helpful if you wrap the items individually, but not necessary. We will package items if you are not able to. Please drop off goodies in the Holy Name School computer room on Friday, October 12 between 12:00 p.m. and 6:00 p.m., or on Saturday between 8:00 a.m. and 10:00 a.m. Please return the bake sale form to the school office by Tuesday, October 9, 2018. If you have any questions, please call Jennifer Bogan at (508) 962-4418 or Katie Librera at (508) 208-2828. Thank you for your time and support in helping to make this bake sale a success! CYO basketball is currently accepting applications for players. The following information pertains to the 2018–2019 season. Please complete the CYO basketball application and return it to the school office by October 26, 2018. The season runs from November until March. We will play games at Sullivan-McCarrick CYO hall on Anawan St. in Fall River. There are usually two games a week. The younger children will have earlier games. Practices are usually at Holy Name School gym. Some games may be at CYO, which depends on coach. The coach also determines practice night. There is a $65 fee. If there are two or more players, the fee is $100. There will be awards and a pizza party at the end of the season for players and parents. For any additional questions, please contact Paul Doiron, CYO coordinator at (508) 675-0405. Classroom advocates play an important role in communicating information to parents. Many teachers utilize their classroom advocates to reiterate important information, coordinate volunteers for field trips, and classroom activities, as well as communicate information from the school’s office. We are asking for volunteers to be their child’s classroom advocate for the upcoming 2018–2019 school year. Please note, advocates must be able to communicate information in a timely manner via-email, as some information is time sensitive. Please return the advocate volunteer form to the office by September 28, 2018, if you would like to volunteer for this roll. The class of 2019 snack kart is now open after school from 2:20 to 2:45 p.m. in the auditorium. Items available include chips, drinks, fruit rollups, gummies, candy, chocolate, popsicles, and much more! Prices range from $.50 to $1.00. Please see our snack kart flyer for more information. Come and check out what we have to offer!